This summer I can’t seem to get enough pasta salad. I serve it as a side or the main course depending on the mood I’m in. 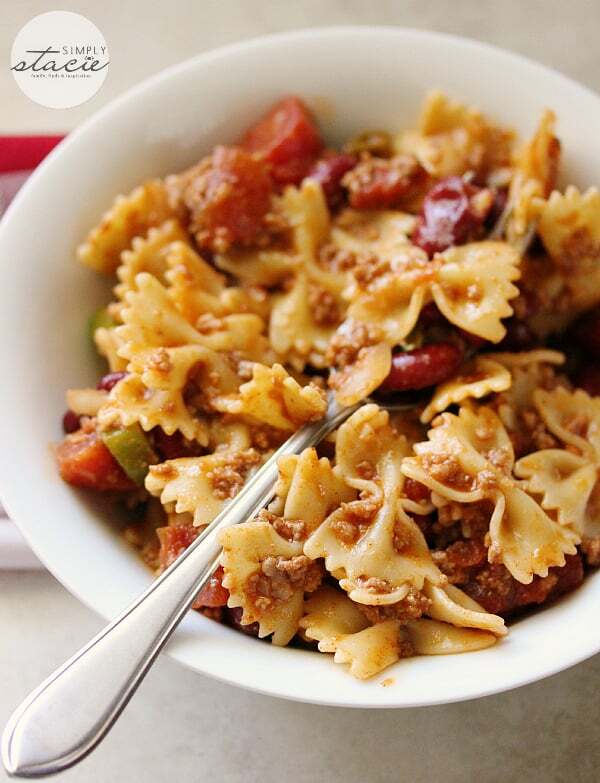 This Chili Pasta Salad is a meal in itself though! I was inspired to make this recipe after whipping up a batch of my Pantry Chili a few weeks ago. I wondered what a Chili Pasta Salad would taste like. The answer? Delicious! Think tender noodles mixed with a spicy chili and tangy garlic dressing. I like eating mine warm, but it also tastes good chilled too. I’ll be making this one again this summer I’m sure! Tender bowtie noodles mixed with a spicy chili and tangy garlic dressing make a delicious pasta salad! Cook pasta according to package directions. Drain and put in a large bowl. Set aside. Heat the cooking oil in a large saucepan on the stove over medium heat. Add in ground beef, onions and green pepper. Cook until beef is browned and vegetables are softened. Stir in package of chili seasoning mix. Add in stewed tomatoes and kidney beans and stir together. Remove from heat and set aside. In a small bowl, whisk together the olive oil, lime juice and garlic. Add the mixture to the bowtie pasta and stir to combine. Add the chili into the pasta mixture and stir together. Serve warm or chilled. *If you don’t have the chili seasoning mix, use 2 tbsp chili powder, ½ tsp cumin, ½ tsp oregano instead. I too, have pasta salads thru the summer, Easy to make and taste great! Will be adding yours to my collection!! Thank You!! another great pasta salad! Inspiring!!!! I will never make it but sounds good. This is something different, I will try making it! Yummy! trying it this week! Love pasta; I am so gonna try this! I love to cook & I always cook from recipes. I am so excited to be back to blogging, after a long time away. It’s great seeing your still here. This sounds so good, I’m going to make this for sure in future! This is a very delicious looking dish, I think part of what makes it look so attractive is the bow tie pasta. I think I need to give bow tie pasta a try. Thank you for sharing this recipe, I can’t wait to try it. Love this!! I’m a huge fan of anything chili. This looks like it would be an amazing, fulfilling meal. This sounds so good. We have been moving and everything is such a mess. I haven’t done much cooking. Will pin this to have later. Thanks for the tip on the chilli seasoning too! 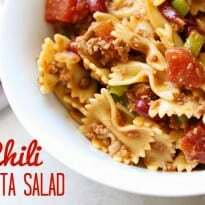 What a good idea, combining chili with pasta to make a cold salad. Sounds delicious! This recipe looks so good! We have a lot of pasta salads during the summer & I am always looking for variations. Have to give this one a try! always looking for a good summer salad and this will be on my table! Sounds great! 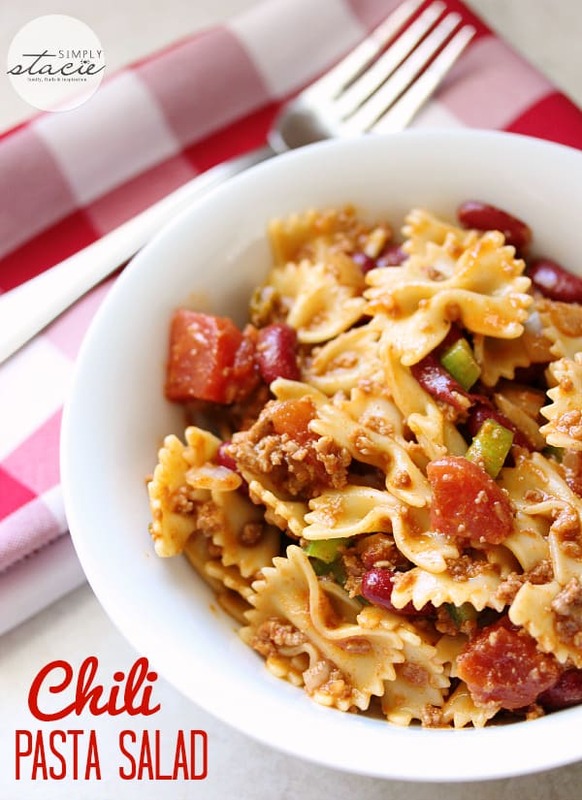 I like chili mac so this would be fun to try. Also, you could use different leftover chilis to give it different flavors. Keep on with the pasta salad…summer is a great time for them and what a creative way to “summerize” a “winter” dish. I love pasta salads in the summer and this one looks very tasty. I will be trying this one out for sure. Thanks for sharing. I will have to make this summer for the hubby… It sounds like something he’ll love! What a different idea for a pasta salad! Thanks for sharing it, I am going to put it on the menu for next week! I made this for a potluck last night and it went over really well, thanks for the recipe! I get tired of the same old pasta salads–either mayo based dressing or an Italian style. Great idea for something different! Thank you for linking. HI, I added this to my daily blog post for Mon Jan 25 – 5 AM- Gave you total credit with links to your page! Hope that is okay. We love this recipe.